The accessibility of the internet all around the world is a defining phenomenon in the present times for everyone. The best thing about the internet and what has made it popular is that it solves each and every problem since information is what everyone needs. Social media is another great phenomenon that has over time gained popularity and is keeping everyone glued. Social media presents itself in many forms among them being business networks, social gaming, microblogs, chat apps, photo-sharing platforms, forums, and social networks. It is one of the leading platforms that has brought debate on the harm that it has caused in the present society. However, the social media is one platform that has offered opportunities and benefits to the users both corporate users and individual users. The easiest way to get information across without limitation of geographical boundaries is through social media. Numerous social media sites incorporate a feature which allows people to chat. The social platforms are applicable in situations like where a group of students needs to meet up and discussion on assignments. The social media can be used where students make time and meet virtually. Therefore, there is no excuse for one missing a discussing. They can also use them to incorporate professors where all they need to do is communicate to the lecturer, and it turns out to be in a classroom away from a real class. The social media, therefore, saves time for each and every of this student which could have been used in going to meet up with the professor physically for the same information they have acquired virtually. Social platforms are an open opportunity for anyone to build contact. Contact building is beneficial to anyone who is interested in growing and developing in life. On social media, everyone has a chance of communicating with people who can inspire them, for example, business leaders or corporate leaders in the present economy. The corporate leaders through direct communication like in LinkedIn social platform can be helpful since one can get an interview in the organizations. The connection can only be achieved through a social platform. Many people have been employed through a link on the social platform. Social platforms present individuals with an opportunity to express their ideas on pressing issues in the society. A good example of this is in the elections that are about to take place, through the social media people can express issues on what they feel about a candidate. The same way candidates can communicate about their manifesto to the voters. What makes the social media a good place to express is that in social media when something is posted, there is no limit on how far the post can go. Reason being that the internet knows no geographical boundaries. The social media presents an opportunity to businesses where they get to interact with their consumers directly. Direct interaction with customer means so much to the firm. First, the company gets direct and honest insight on their products. The insights are a valuable factor since the business discovers what the clients think of their products. Same way the company will know the faults in the services and will know about the changes they need to make on the goods or services. Secondly, social media presents an opportunity to the business where they can communicate about their products. Social media is, therefore, a platform where businesses get to market their products directly. A recent study shows that 53% of Americans who follow a company or a brand on social media are more loyal to those brands and are likely to always purchases products or services from them. Therefore, for a business with a social platform, they can communicate about the latest goods or even changes in their products. Through this, the chances are that the firm is going to retain more clients as they are kept informed of every little detail. It is part of the business where it is easy to keep old customers than to acquire new ones. It is also very easy to gain new ones through word of mouth by a satisfied customer. Another great advantage of this is that the marketing is not expensive at all and businesses get to reap the fruits immediately. The only expense the company gets is time spent on updating the profile now and then. Comparing to the cost of advertising on T.V or billboards, this is not expensive at all. The social media is the best point of advertisement for startup businesses that do not have the money needed to advertise on the traditional media. Finally, social media allows the business to be visible worldwide. Using traditional means of communication could also get the company to be known worldwide but it takes long, and a lot of money is spent. Social media, however, provides tools and equal chances for a business to expand beyond boundaries where the internet is available. 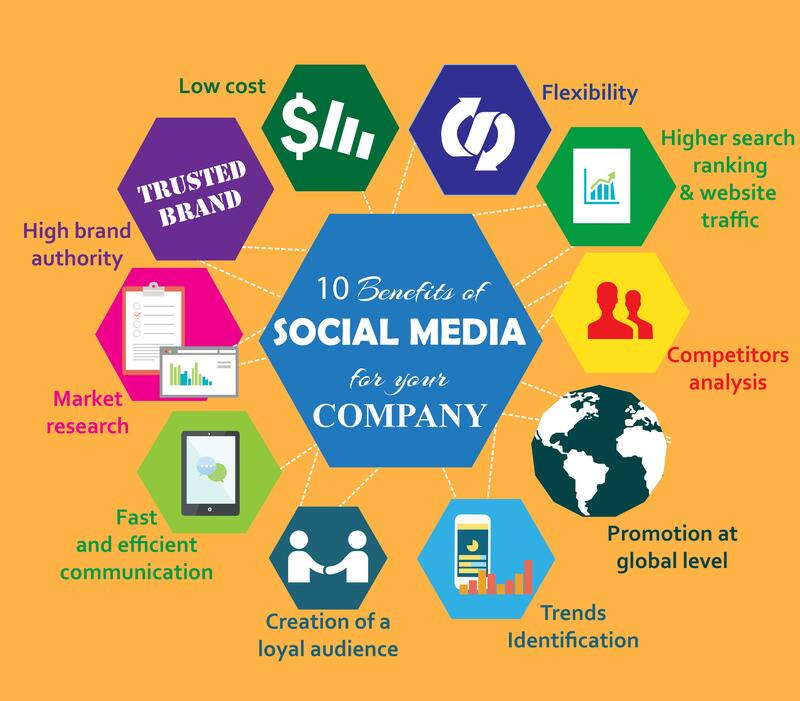 The social media allows a business to customize their content according to specific target market while allowing the business to communicate about these products with a click of a button. It is a platform even the mainstream media have joined to stay relevant with providing information to people. When a product goes viral, there is no limit the how for and for how long it will go. As much as people would like to talk about the evils of social media, the platform as seen presents numerous opportunities to every one of the users. All that is required is a proper usage of the sites to obtain the benefits. Otherwise, it will be a platform that produces negative effects to the users. A. The accessibility of the internet all around the world is a defining phenomenon in the present times for everyone. B. Thesis statement: The social media is one platform that has offered opportunities and benefits to the users both corporate users and individual users. II. The easiest way to get information across is through social media. A. Numerous social media sites incorporate a feature which allows people to chat. B. The social media therefore saves time. III. Social platforms are an open opportunity for anyone to build contact. A. On social media, everyone has a chance of communicating with people who can inspire them. B. Many people have been employed through a connection on the social platform. IV. Social platforms present individuals with an opportunity to express their ideas on pressing issues in the society. A. A good example is the elections that are about to take place. V. Social media presents an opportunity for businesses to interact with consumers directly. A. The business gets direct and honest insight on their products. B. Social media presents an opportunity to the firm where they can communicate about their products. C. Social media allows the business to be visible worldwide. A. Proper usage of the social platforms is required to obtain the benefits.